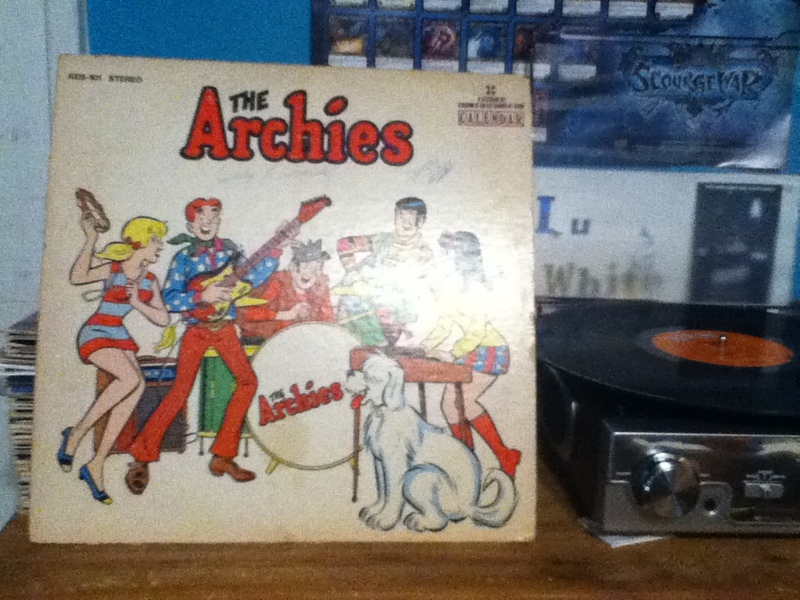 My plunge back into collecting and listening to vinyl albums started when I found The Archies debut album at a local antique shop for $3.00. My original intention was to have the album framed to hang in my mancave. When I got home I pulled the record out and was very surprised to find that it was nearly in pristine condition. This put the bug in my head that I had to find a record player and give the album a listen and this past Monday i did just that. It was the first album I played when my turntable came in and I was pretty shocked that the kids stayed and listened to it with me. I've read my share of Archie comics as a kid and when standing in line at the grocery store I'll grab an Archie digest and start reading. During the late 70's and 80's I watched reruns of the Archie cartoon series where the songs from this fictitious band were spotlighted. It wouldn't be until many years later that I learned that some of the same people involved in the production of The Archies did the same for The Monkees. I kept all of this mind as the album played and I could easily replace Ron Dante's voice with Mickey Dolenz and Davey Jones. The Monkees turned down the song Sugar, Sugar as they wanted to get away from the bubblegum rock and write their own music and so the song instead became The Archies biggest hit. 1. Archie's Theme (Everything's Archie) - How do you keep this song from being the earbug that never ends? This is the tune you hear at the start of the cartoon series and I catch myself whistling it quite a bit now. 5. Hide and Seek - This one is the kids' favorite song from the album. 6. Bang Shang A Lang - Another tune that's hard to keep out of your head. In the cartoon the band consisted of Archie on lead vocals and guitar, Reggie on bass and backing vocals, Jughead on drums, Veronica on the organ and Betty on tambourine. Hot Dog of course was the the logical choice to be the band's mascot and conductor. 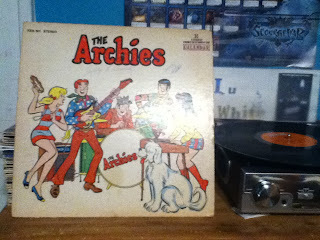 The real folks behind the scenes providing the sounds over the various Archies albums were Ron Dante, Hugh McCracken, Chuck Rainey, Joey Macho (what a name! ), Ron Frangipane, Gary Chester, Buddy Saltzman, Toni Wine, Donna Marie, Merle Miller and Richie Adams. Songwriter Neil Goldberg also contributed to backing coals and rhythm guitar. By no means is this a bad album, even the worst songs aren't bad. It easily haunts you with its catchy tunes and you will want to bang your head against the wall to get Bang-Shang-A-Lang out of your head. I'm going to have to hunt the other albums down now. You can check out this album out at itunes or if you're lucky you may be able to find it at a local library.